When you need to stand out with high-impact colors, Astrobrights® Colored Paper is a great choice. It's 20% thicker and more substantial than ordinary printer paper, so you can achieve great results for one- and two-sided documents. Plus, because the colored copy paper creates a vibrant background, you'll save on pricey full-color ink printing. Easily create vibrant fliers, brochures, school projects, signs, coupons, posters and paper crafts. Brighter colors. Brighter ideas.TM Can't decide on just one high-impact color? 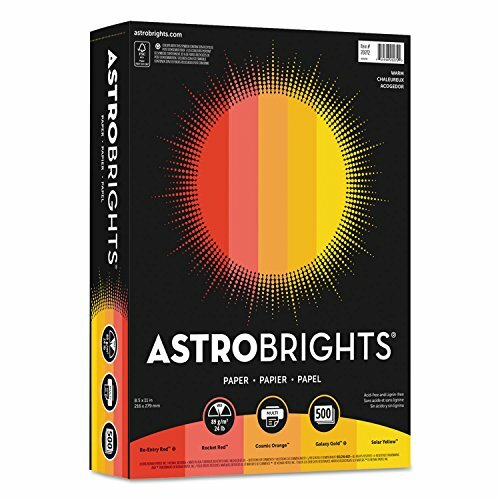 With the Astrobrights® "Warm" Assortment, you don't have to. Get ready for your most creative ideas to really take off! Size: 8 1/2 x 11; Paper Color(s): Assorted; Paper Weight: 24 lb / 89 gsm; Sheets Per Unit: 500.